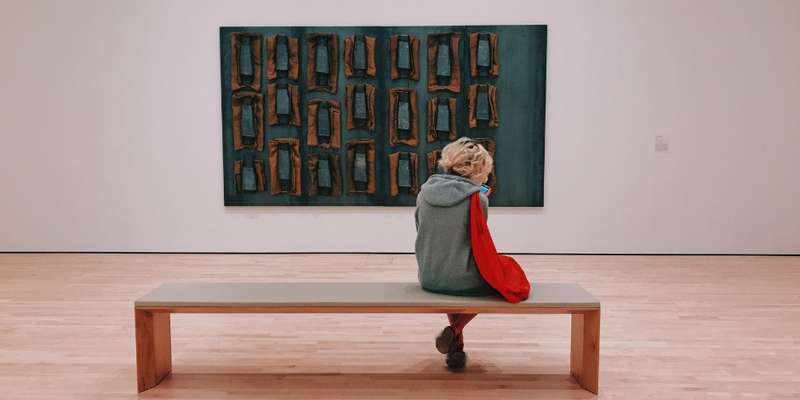 Want to become a content curation pro? You’ve come to the right place. In this guide we’ll teach you how to source and share great content on social media. Content that your audience will like, comment on, and share with their followers (exposing your brand to a wider audience). It’s adding your voice (and value) to a handpicked collection of content. Gathered from a variety of sources, around a specific topic, that you publish and share with your fans. Wherever they may be. Yet, many do this without a strategy. After reading this article you’ll be more equipped (and excited) when scrolling through your content feed. Because living in the information age demands people manage, organize, and share information with others. Efficiently. What we know, how we manage what we know, sharing it with others—these are all keys to the info-game. Be deliberate about what you want fans and followers to think of your brand. Be it on Twitter, LinkedIn, Instagram, Snapchat, Pinterest and all the usual suspects. Curation content is one aspect of your stay-on-top-of-mind campaign for being seen as an expert in your field. Creating (vs curating) content is a required piece of your content marketing strategy. However, writing blog posts, making YouTube videos, or Snapchatting takes time and energy. Share something excellent already created for you. It keeps the conversation going. What a relief, too, knowing you can share what you’re already reading on your desktop, tablet, or phone. Maybe even your watch? By showing and sharing what’s important for your business. Every time people see you their feeds and screens, it’s another notch in their yup-she’s-in-the-game. As a social curator, you’re better than that, right? Right? When helping others, others help you. Sharing and curating content can help you make connections with leaders and influencers in your industry. And, spark conversation with your social media audience in general. If you got something worth saying, created or curated, you’ve got people’s attention. The more you share, the more eyeballs you attract. Use this as your e-carrot to hook them in to say, your email list. For all the above… it’s about them. But what about you? Curating and sharing content keeps you on your business-toes. Spending time finding, sifting, and reading pieces across the web, for your industry, helps you learn more about your business. Obviously, you’ll need to determine the topics to share with your fans. Then locate the articles for those topics. There’s tools for this. You’ll see some shortly. Who should I share this with? Why would this help them? Is this a trustworthy source? Is it unique and worthy of sharing? Will it make the reader grin, snicker or blush? Once you’re good on these, time to schedule them. Say you like a post about awesome tips for designing a web page rendered on a mobile device. Glad you’re so excited about it. But before hitting the schedule-this button, ask those questions above. Because this is about them, not you. You’re sharing because you’re caring—caring about how this post will help readers do their job better (as on example). That’s all I’ve got to say about this. Every Monday, I find, share, and schedule 10 articles for the week on LinkedIn. As I’m scheduling each piece, I write a blurb summarizing a key point or takeaway. To help the reader identify with my share. And, to associate this post with my brand. Whether people read this or not, they still get to see an interesting or quirky or useful snippet in their feed. Twice a day. As mentioned, sharing curated (vs created) content is your opportunity to show some breadth. Others will see how you use the web-o-sphere to be a beast in your space and industry. Absolutely, share your own content, too. Say at a 1:10 ratio. You’ll look more real, less promotional. A killer for building trust. Recently, I caught myself sharing too much of the same thing. Topics on writing and designing. I’ve opened up the share-pipes to productivity, self-help, simple apps, and other human topics to improve how we work each day. Ultimately, I care about helping people get clear and unwhelmed, organized and efficient, informed and excited. Why? For humans to perform their job better, everyday, and feel great doing it. Both, the topics I share and the blurbs I write contribute to this. And it feels good, for you and them. Add an @mention in a tweet, or tag the content creator in a Facebook post (as two examples) for any content you’re sharing. …so your curations will be seen over a balanced period, like a week. Use a social media calendar to map out what you’re going to post. Then use a program like (ahem) Hootsuite to schedule your posts. A set-it-and-forget-it approach, one time, versus posting multiple times a day. But don’t schedule too far in advance. You still want your posts to be timely. …to learn what’s working, what’s not, and what to change. Learn how in this Hootsuite post about social listening. And, check out this video from Hootsuite Academy for some content curation best practices. Got a better idea of why and how to curate and share content? Are you onboard with this all? Is it annoying, me asking so many questions? Check out these tools that can help you become a content curation pro. Want to see what key influencers are sharing? And when? BuzzSumo helps you find the most shared content on the web, for specific topics, in the last few hours or months. See top 10 influencers for a topic, too, and what they’re sharing. From $79 to $559 a month. Even cheaper if you pay by the year. Especially if you don’t organize the accounts you follow. Use Twitter Lists to share and respond to followers, no matter how many of them you have. Lists will help you categorize and organize your followers, so you can engage with them in segments. Want some help using Twitter lists? Check out the video below. 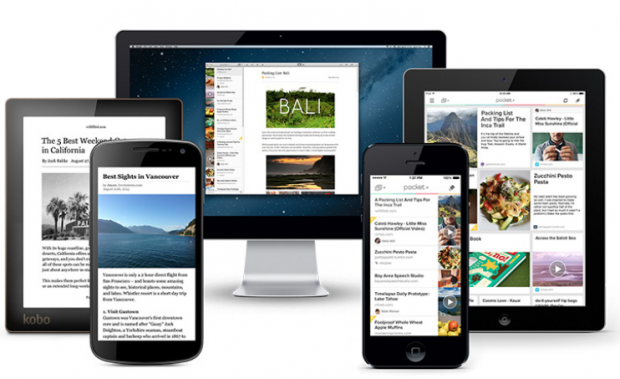 Save articles, videos and stories from any publication, page or app. From any device. Better than using a laundry list bookmarks or countless emails sent to yourself with links. Pocket keeps all your interesting images, articles, and videos in one place. Capturing and collecting information is the first step in sharing your curation. From free to $4.99 a month. You subscribe to newsletters and blog posts, don’t ya? I set up Gmail to automatically label my incoming subscriptions. I now have a repository for sharing loads of useful content. I click on the label and can see all my articles, sorted by date. Come Monday morning, I browse and pick the items I want to share for the week. You can do the same. No matter what email program you use. And it’s free, free, free. See something you like on the web, that you might want to share later on? Instapaper is waiting for you. Sign up for a free account, create a folder (e.g. ‘posts to share’), and a bookmarklet, too. For any article in view from your browser, click the bookmarklet in your browser bar. Instapaper will save the page in that folder. In seconds. Do this all week long. Again, come Monday, yet another source of articles for you to share. Manage all your social media channels from a single platform. Or, you could keep: a) logging in to each app, b) move them around just so on your screen and, c) share and reply from each and every window. Use Hootsuite to do everything from a single, unified system. Share, schedule, analyze, monitor your social presence using ‘streams’. More for keeping up with your favorite feeds and articles. All in one spot. Use Feedly also, to keep track of internal information, and when your business is mentioned online. 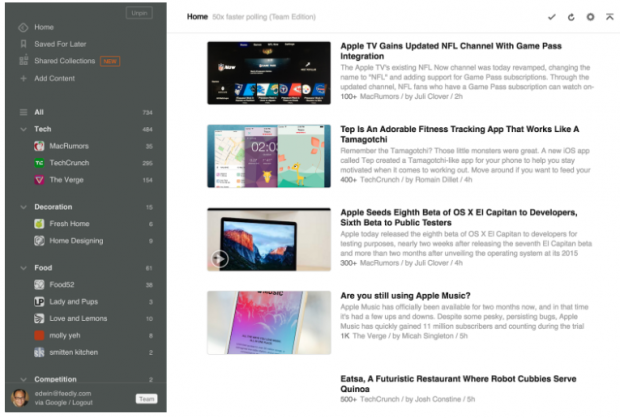 Add sources to Feedly. Browse them later to share with others. Here’s how. From free to $18 a month. Collect and curate content—with a Pinterest-like approach. Use Scoop.it to find things organize topics in a hub page. Then, publish your stuff elsewhere, such as your blog. From free to $67 a month. Be known by sharing only the most relevant and helpful content. Curata listens to what you’re interested in. Then, discovers and recommends content for our audiences. Mostly automatically. Of course, you can (and should) add your touch by fine tuning content sources. Then, review and distribute them, from a single tool. Repurpose curated content, too, across your blog, social, newsletter, and automated marketing platforms. Cost? Mysterious. Call 617-229-5529 to get a quote. Like Curata, PublishThis, gathers content relevant for your audience. It’s a big time-saver for daily curation. 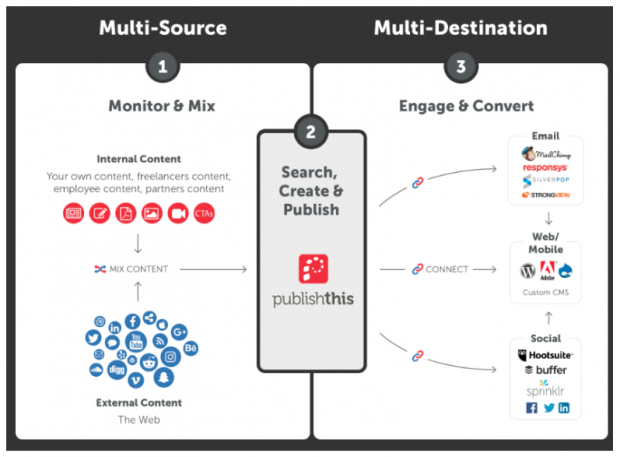 PublishThis can collect content from you, your freelancers, your employees and partners. Then, mix it up and share it out across other platforms, like email, web and social sites. From free to $399 a month. Hootsuite can help with your content curation for social media. Find content to share, schedule it to publish on your social channels, and track your success—all from one dashboard. Todd writes long-form copy people read and scroll -versus- stop and leave. Track him down at toddsgotapen.com. He likes that. View and download the guide here.